Honda is out to prove to the world that the bed of its all-new Ridgeline pickup is tough. First it dropped a bunch of rocks onto it, a seemingly simple test that somehow morphed into a viral video. Now Honda is back with a more real-world test, the toolbox test. A toolbox was filled with 26 pounds of equipment and then knocked onto the bed. Crazy stuff, right? In perhaps the most shocking video of the year the bed of the Honda truck wasn’t damaged whatsoever. Seriously, did anyone think that wouldn’t happen? We get that some “real truck guys” might take issue with the Ridgeline, but Honda may be going overboard here. Stick to dropping heavier crap in the back to prove the truck’s toughness, not 26 pounds of hammers. 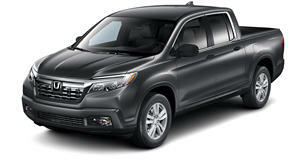 Is the Ridgeline ready to be taken seriously by truck guys? Note to Honda: we may have left a keg in the rear storage compartment.